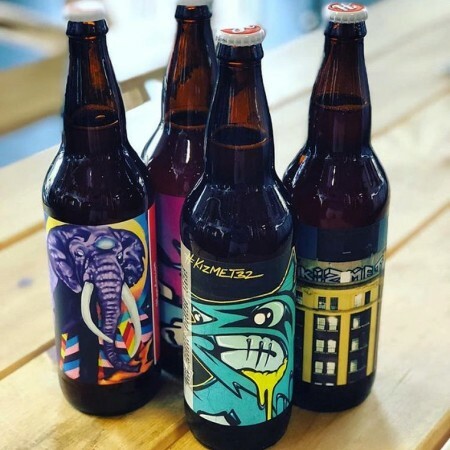 TORONTO, ON – Henderson Brewing has announced details of latest in its monthly Ides Series of limited edition beers, with this month’s release paying tribute to a local artist. Juicy fruity peach and nectarines up front with complex floor of crackers, toast, and baking bread flavours. No perceptible hop bitterness or flavours. Mild earthy notes at the end. Finishes dry encouraging another sip. Kizmet (the beer) is available starting today at Henderson in 650 ml bottles with labels featuring artwork by Kizmet (the artist). The official launch party takes place at 6:00 PM, and will feature complimentary samples of the beer paired with peach cobbler.